When we aren’t sure if food is safe to eat, it generally ends up in the trash. But food waste that ends up in landfills is harmful to the environment because it emits methane, a greenhouse gas, as it decays. Plus we may waste perfectly good food! “Sell-By” date–This tells the store how long to display the product for sale. The product should be purchased before this date. “Best if Used By (or before)” date–This is recommended for best flavor or quality. It does not refer to safety. 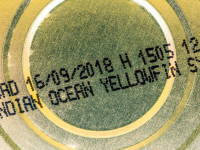 “Use-By” date–This is the last date recommended for use of the product. You should discard a product after this date. According to the site, EatByDate, “all foods, except infant formula, have a life beyond their printed date, whatever the manufacturer has chosen to call the date.” This handy website has a list of foods and you can search to find one you have questions about. For example, here is the information on the shelf life for milk. Bring home food that is dated before its expiration. Refrigerate perishable food as soon as you bring it home, or freeze it if you can’t use it within the time recommended on the label. Frozen foods are safe indefinitely until thawed. Be sure to follow safe handling instructions on the product.